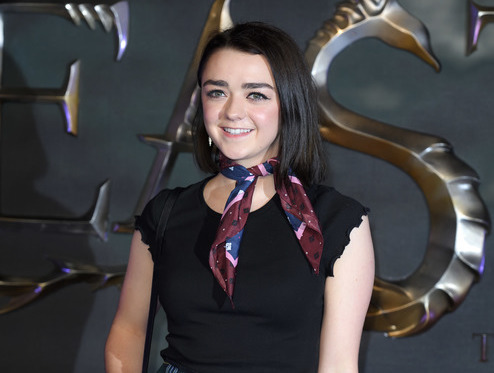 She may play the scrappy wannabe girl warrior Arya Stark on Game of Thrones, but real-life Maisie Williams is less scrappy and more perfectly put-together. Today, Williams was spotted outside London’s BBC Radio One where she was promoting her new Netflix sci-fi thriller, iBoy. To her interview, Williams wore a dark oversized olive coat, black and white gingham pants, and carried simple black leather handbag. We greatly appreciate Williams’ overall causal elegance, but those boots are what is pulling this whole getup together. The split-seam patent leather ankle booties are seriously distracting us with their spectacular shine. Ankle booties are going through a bit of an evolution at the moment. Thanks to Yeezy and the Kardashians, we’ve begun to request that our booties are tighter around the ankle to create that sock-like illusion. We want the boot to rise inches above our ankle, rather than hitting just above the bone. And of course, continuing the 90s trend — the chunkier the heel, the better. Keeping these factors in mind, we went shopping for you and found some patent leather “beauts” (get it? Beauts? Boots?) inspired by those on the feet of the ever-so-classy Maisie Williams. 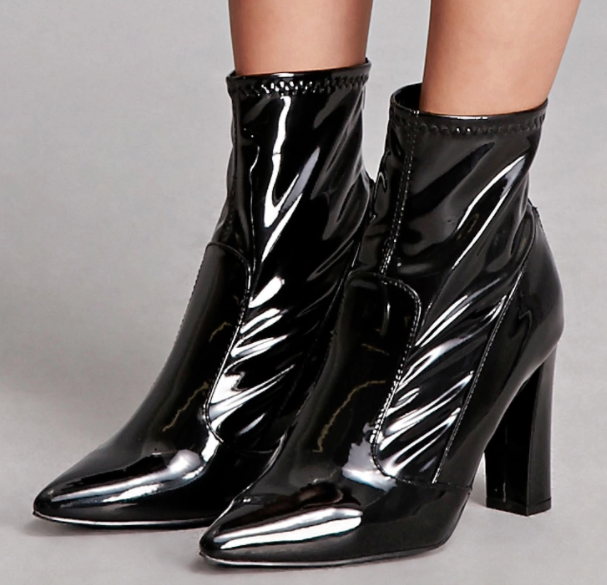 The New Look Patent Heeled Ankle Boot from ASOS ($53). We like these because of the tight “neck” and chunky heel. Similar to Williams’, these boots have a slightly squared-off toe. Obviously the patent leather is a big seller, too. These gals from Forever 21 are great for those who like a sharp pointy toe ($48). 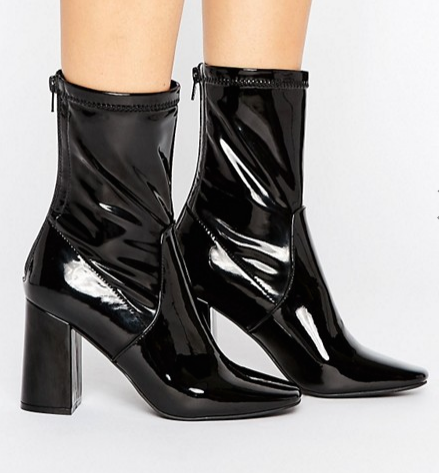 These are similar to the ASOS boots, but their pointed toe and slightly tapered heel make them a little different. 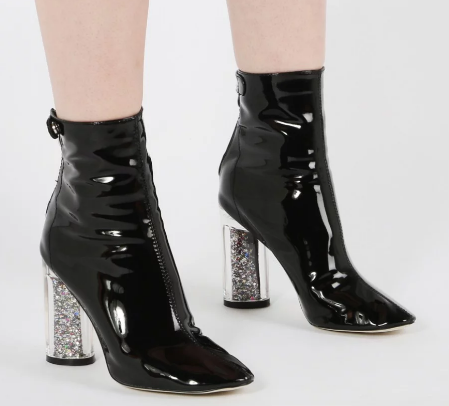 The super fun Lia Glitter Heel Ankle Boots from Public Desire (29.99). Mix and match trends by getting yourself a patent sock boot with a lucite heel. And what’s better than a lucite heel filled with glitter? Grab some patent sock booties à la Maisie Williams and jump on the trend bandwagon. They’ll definitely add a little spice and shine to any outfit.